Oil on canvas. 64 X 53 cm. Inv. 1036 Signed lower left: C. Natoire f.
The subject of the picture is taken from Virgil's Ae-neid (8:370—385). 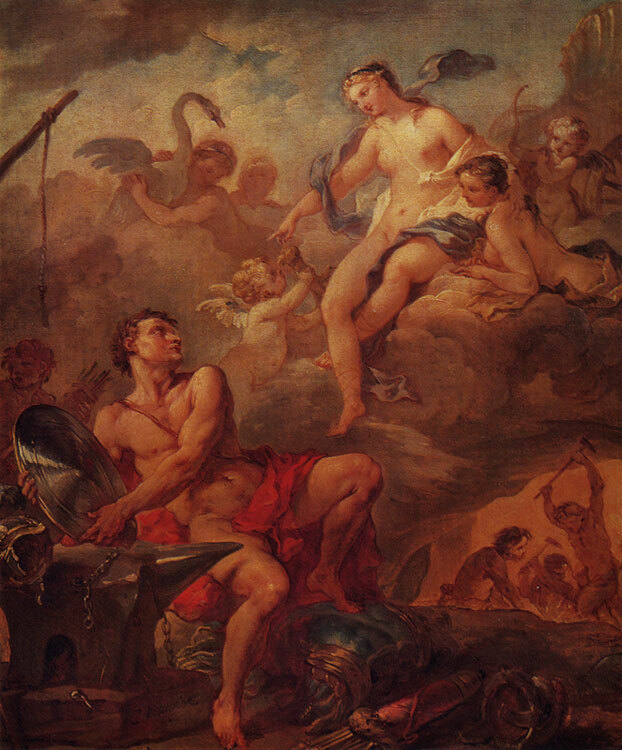 The present work is either an original sketch or a smaller replica of a picture on the same subject, which was painted by Natoire in 1734 and for which he received the title of Academician. This picture is now in the Musee Fabre at Montpellier (192 X 138 cm, No 420), where it was transferred from The Louvre in 1803. Another picture on the same subject, included into the Four Elements series as an Allegory of Fire (110 X 150 cm), is now in the Museum of Fontainebleau, where it also came from The Louvre. There is yet another variant in the Musee des Beaux-Arts in Bordeaux (though the attribution is doubtful). The Detroit Institute of Arts (USA) has a replica of the Moscow picture (63 X 51 cm), but its poor draughtsmanship does not warrant its attribution as a Natoire work.